To illustrate my point compare these two maps – the first from the Jimmy James Archive taken from the SE Study 1964 (im pretty sure). The area of the Metropolitan Green Belt has almost tripled. What happened was there a big strategic plan in the 1960s, 70s or 80s planning this. No the London Green Belt has never had a statutory plan setting out its full extent. The famous circular of 1955 set its extent as 5-7 miles – simply Unwin’s 6 miles figure (plus a civil servants 1 mile buffer) from his 1926 report. Unwin was concerned with the picturesque and 6 miles was his assessment of the minimum distance for the edge of an urban area to fade into the landscape background. The figure was taken up by Abercrombie’s Post War Greater London but this was never a statutory plan. The Ministry only set down an indicative map of London’s Green Belt based on it. Following the 1955 circular Green Belt could only be designated by county maps and then structure plans. ‘the main object of these revisions is to bring the greater part of Surrey into the green belt with the object of ensuring that if London’s population overleaps the green belt, as it’s clearly doing, the emigrants shall alight, say, in Hampshire or Sussex, rather than in Surrey’. A series of Home Counties structure plans did the same throughout the 60s, 70s and 80s the Green Belt extended to Tunbridge Wells, to Letchworth, even to Raleigh. Only in Berkshire did the government back up the structure plan panel report against expansion. It was politically convenient for governments not to enforce the 1955 circular on the extent of the Green Belt. Especially after the publication of the Peter Shore Inner Cities White paper in 1977. 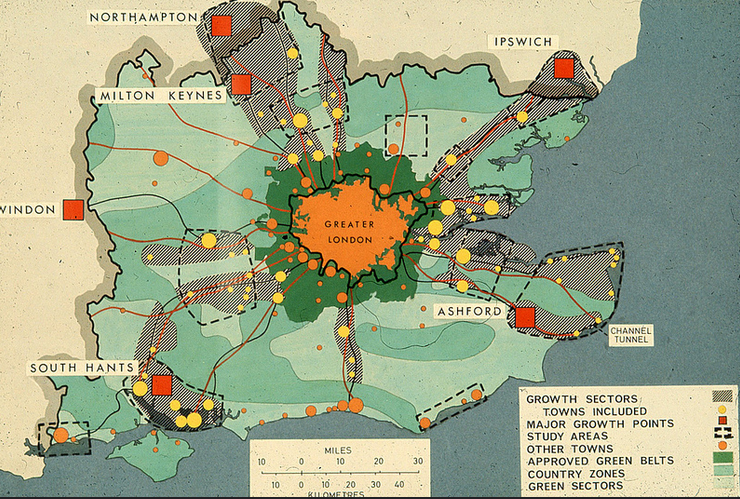 Hence the Green Belt grew not because of a plan but because of a series of ad hoc expedient decisions taken against a temporary lull in the growth of London’s population. Subtley the focus had shifted from controlling the growth of London, which was no longer growing, to controlling the growth of Home Counties towns, which were. The growth was to be displaced to New Towns but with Thatcher the new towns programme was left to run out of steam with nothing to replace it. Next year there will be some kind of growth ‘summit’ between the GLA and SEEC. The inspector to the London Plan alterations just said that an urgent review of the current strategy (which must include the Green Belt) must take place and that areas outside London will need to take much of this growth. AECOM have calculated that on current trends London and the South East will be short of a million homes by 2032. The time is right for a proper plan of what the London Green Belt extent should be – the alternative would either be a series of ad hoc deletions or not meeting the critical need for housing. The NPPF like PPG2 before it asks to compare the options of developing on the inner edge and beyond the Green Belt but I for one cant think of a single actual planning study where this has been undertaken. I don’t think it would be a good idea just to let London expand to the M25, for reasons stated on this blog before. Frank Pick’s contention that the London Underground capacity sets a limit on London’s radius to 12-15 miles remains, but now that their is potential to relieve capacity in some quadrants (with regional metro and double decker trains) expansion may be possible in certain limited areas. The potential capacity of sustainable locations in this ring is surprisingly low, but it needs to be looked at. SEES/ROSE authorities are looking at Green Belt reviews and will insist London does the same after the FALP inspectors report. Like Corrinne Swain I think it is most likely that an expert report will be commissioned well before agreement on structures, which is pretty much what is happening around Brum, and this can and should be visionary, like the Le Nouveau Grand Paris project. It would be astonishing to if the study did not look also out to Cambridgeshire, Northamptonshire, Suffolk, and Wiltshire. The key theme of such a ‘Grand London’ study would be fairly obvious, the east west shift in geography with the east coast ports, the opportunities of HS2, the growth of Heathrow, the capacity constraints of the current London-Brighton line and the constraint along the Sussex Coast, the constraints of European areas like the Thames Heaths and Ashdown Forest and so on, the still unmet potential of the Thames Gateway, in particular the Hooe Penninsular and Swanscombe which have never had a proper plan. It would be a great tragedy as well I think if this was purely a land use study and did not consider the potential for London regional metro services and how current constraints can be overcome. There is little point in building a Garden City or major growth node around a station if that line has no train paths and the London Terminus has no free platform slots. With lines out of Waterloo, along the Lee Valley and out to Watford (with this becoming part of the Overground) having the greatest capacity potential. Apart from various relatively minor Green Belt deletions and expansion of growth nodes outsideit the most logical place for major new growth nodes would be at the HS2/East West Rial intersection near Brackley, at East Hooe Pennisular (as proposed by Shelter), between Dorking and Horsham and near Royson (south of Cambridge). All I note outside the Green Belt, with no real sites with this this scale of potential capacity or less sensitive in landscape terms within the Green Belt. If each took a new city with a design size of around 150,000 then 95% + of the Metropolitan Green Belt could be protected. I think loss of Metropolitan Green Belt could be restricted to around 100-150,000 units and the remaining 300,000 or so units could be comfortably handed through expansion of existing growth areas and densification of some brownfield areas of London at higher densities than planned though tube extensions (for example through the Upper Lee Valley and to Thamesmead). On a global scale of how to cope with the Urban Billions this is really no big problem, there are far worse. Green Belt review is part of the solution but its not actually the key planning challenge. That is how you can provide the terminus capacity in London to handle additional commuters, and that might mean mean new terminus’s at areas like Bishopsgate Goods Yard and ‘Euston Cross’, and secondly how these new large Garden Cities are sustainable through people using rail connections, and that must mean tram and BRT networks from the off in them.